Zero Plastic Waste: This Crockery Bank Lets You Rent Steel Utensils For Free! Crockery Bank For Everyone is a non-profit initiative that lets people rent steel crockery for events and langars, all for free. The idea behind this initiative is to reduce plastic waste and encourage Delhiites (including heads of all religious groups) to lead environmentally-conscious lives. 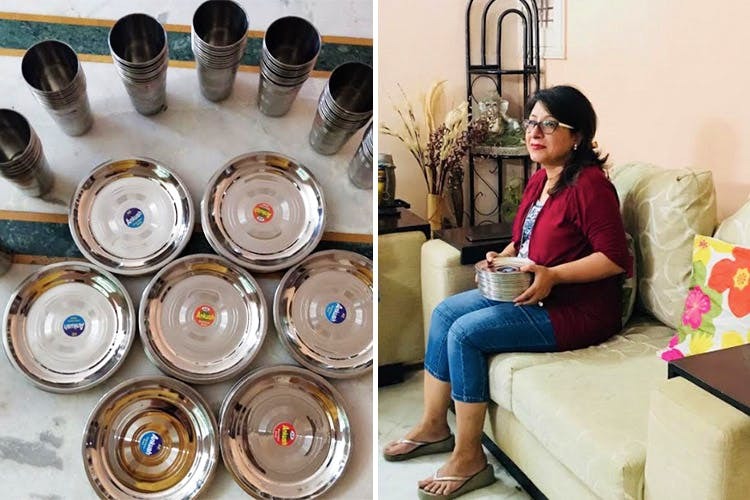 Crockery Bank For Everyone was launched last month by Sameera Satija in an attempt to make Delhi NCR a plastic-free city. Sameera's a Gurgaon resident who was sick of living in a city with plastic-covered/clogged roads and sewage systems. Instead of cribbing about this, she decided to take matters into her own hands and came up with this novel initiative. This bank lets anyone rent steel plates and glasses for free. All you need to do is drop a message on their Facebook Page, share your personal details like name, address, along with a copy of your ID proof and also, the kind of crockery that you require. You'll then have to drop by Sameera's place in Gurgaon to collect the utensils. In return for the plates and glasses, she doesn't want anything, really. But if you do want to help Sameera, you can donate money for a thali and a cup, but an even better alternative she suggests is starting your own crockery bank in your area. People have raised health concerns over this system of an open crockery bank, but Sameera recommends that if you use Potassium Permangnate or soapnut powder (reetha) to wash the utensils, everything will be fine. She can even get you the powder for just INR 30. Plus, using the Crockery Bank's utensils is any day safer than eating and drinking in the regular styrofoam cups (loaded with chemicals). Despite having a regular 9-5 job, Sameera's dedicated to make this city a better place to live. She also orgnanises her own composting workshops, educated and is more than happy to collaborate with RWAs and CSR groups locally. Check out her Facebook page for more info.